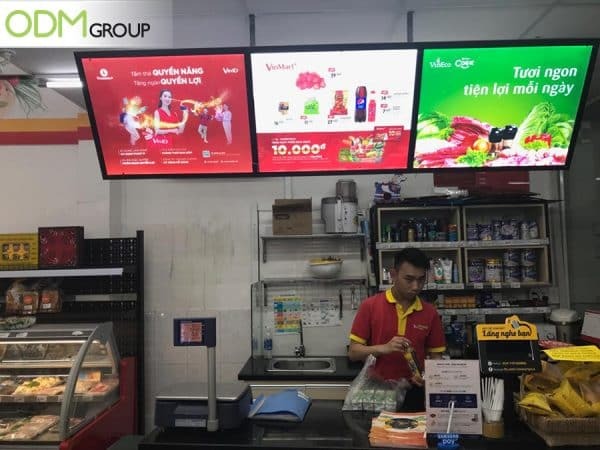 Ho Chi Minh City is rising up to the age of digital technology by placing a LED advertising board in its local convenience store: Vinmart+! It is able to stimulate interest and attract more customers to patronize the store due to the use of vibrant colors. This is what every company should consider – to keep up with the latest trends of innovation to gain a competitive advantage over rivals. Why would LED Advertising Board Be Good For Brands? Higher Visibility – LED writing board is large and will not fail to grab the attention of many customers. Any brands that are being advertised on the board will definitely be noticed. This will also increase brand awareness of the many great products available for purchase. Sustainability – The splash of bright colors will draw customers’ eyes to the message the brand is getting across. Colors will help with brand retention as people will definitely associate the brand to a specific color over time. This sustainable digital marketing tactic is certainly a smart way to distinguish itself from competitors as compared to traditional marketing! Increase in Sales – Using the board lowers costs as creation comes from unique video advertising content. Hence, it eliminates production costs. These expenses can then be used for other purposes to further improve overall sales. This way, you are able to maximise profits and efficiently promote your brand. Such creative LED display is indeed a versatile and user-friendly marketing tool for many brands to communicate their message across! We highly recommend to market your products and promote your brand through LED advertising boards. Keen on creating something similar? Enquire @ ODM for more ways and explanation on how you can vastly improve your business. Our product designers will be able to provide you with multiple unique and interesting ideas for you to wow your audience and increase brand recognition. Here at ODM, we specialize in manufacturing and creating a simple and bespoke packaging design that will certainly help you in your next promotional campaign. Feel free to send your inquiry! ODM have recently spotted a great advertisement idea – A glimmering LED Display by Marlboro in The Streets of Tokyo. This eye-catching display is bound to attract the attention of many, thus doing its job in increasing brand exposure and visibility. Check it out!